In October last year, the Bundesbank was criticized after federal auditors questioned the degree of control exercised by the Central Bank of Germany on its reserves of gold, that are ranking second globally after the US. "There was a public debate, but I took this decision alone," said Carl-Ludwig Thiele, Bundesbank board member. "It was an independent decision," added Thiele. He added that the institution's decision to repatriate the gold held in Paris reflects the fact that France and Germany have a common currency so there's no need for the gold to be stored in Paris in order to be exchanged into currency. Instead, there are still reasons to store some gold reserves in New York, as well as 445 tons of gold to be stored in London. Carl-Ludwig Thiele did not want to say how much will be transporting gold and how it moved, stating only that it is a procedure that will run "step by step" and will begin this year. "Of course, there are some risks with the transportation, which means that there will be some insurance costs," said Thiele. Germany had no gold reserves after the Second World War, but began to accumulate gold in 1951, and these reserves were kept abroad for fear of possible Soviet invasion. Germany's gold reserves is now 3,400 tons, ranking second in the world after the United States, which holds more than 8,100 tons. Next are Italy and France, with more than 2,400 tons, followed by China with 1,054 tons, 1,040 tons Switzerland, Russia over 900 tons and Japan with 765 tons. 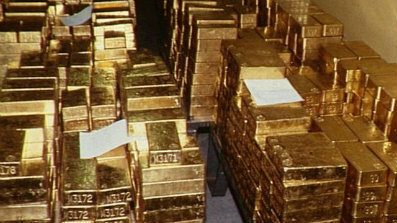 Currently around 30% of Germany's gold reserves (270,000 gold bars worth about 177 billion dollars) are kept in the country at the Bundesbank in Frankfurt. After the transfer Germany will have half of its gold reserves domestically and half abroad.